October 18, 2018 October 19, 2018 mlbradford 2000AD, Alan Moore, aliens, Berni Wrightson, books, cake, comics, Dystopian World, Fantasy, Frickin' Quarnex Battery, H. P. Lovecraft, History, Horror Movies, Lucid Dreams, Magic, Nostalgia, Psychology, Quest, Religious Issues, Science, science fiction, Stuff that Matters, What Is Real? “You ask me to explain why I am afraid of a draught of cool air; why I shiver more than others upon entering a cold room, and seem nauseated and repelled when the chill of evening creeps through the heat of a mild autumn day” – H. P. Lovecraft. This month – in preparation for Halloween – we will be taking a special look at horror. 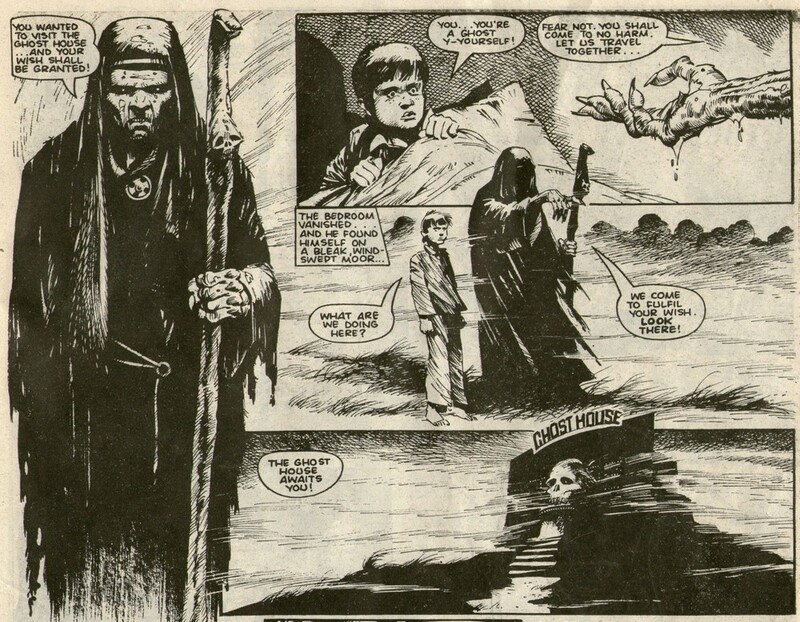 Despite not being much of a horror comics fan, several rather creepy mags still lurk in these musty – Blimey! Get a loada’ the cobwebs down ‘ere! – corners of my gaff. One British title, in particular, comes to gleeful and nostalgic mind. 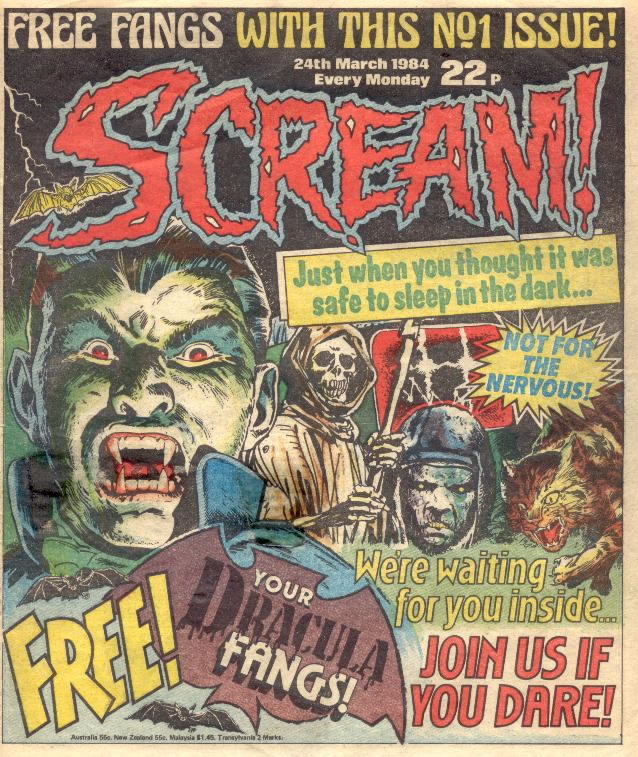 During March 1984, my weekly editions of Battle Action Force (produced by IPC Magazines, more famous for the longest-running SF comic: 2000AD) ran increasingly intriguing ads for a forthcoming horror comic. “Greetings, mortals! I am the once-human editor of this gruesome publication. If you horrors out there want to read something really spooky, you’ve picked the right paper…” – Ghastly McNasty. Will always remember reading and re-reading that first ish of Scream. Waiting for the “Second Spine-Chilling Issue” turned out to be the longest week of my life! 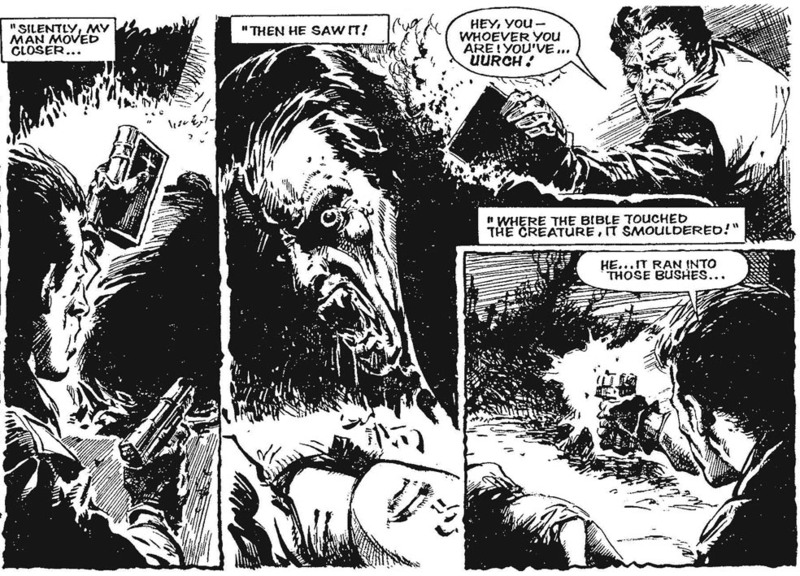 The opening story: The Dracula File could so easily have been skipped – the Count is the most overused/recycled horror character, but this version entranced me from the get-go, especially as it is illustrated by Eric BRADbury (one of my fav artists from Battle Action Force) and a tense script by Gerry Finley-Dey (another Battle and 2000AD regular) interestingly set in the 1980s, against Cold War politics. A “defector” flees across the East German border, surviving a hail of machine-gun bullets and manages to be transported to a military hospital in Britain. Colonel Stakis, at first sceptical, sets off in pursuit, wary of the realization that he may very well be dealing with the Prince of Darkness himself. He cannot inform the authorities in the West of his “unholy” mission, while they, in turn, are exceedingly dischuffed at having a KGB operative lurking freely around the back streets of London. It’s a compelling thriller, gifted with some amazing surreal moments, especially Drac seeking sanctuary at… a fancy dress party! He drains the blood of Harry the Gorilla and seduces Cinderella – not even Christopher Lee could boast that! “Poor devil – I bet it’s been like a nightmare for him. But he’s defected safely – he’s got a whole new life ahead of him in Britain…” – Nurse Nightingale. “That cough of yours is getting worse, Nathaniel! It’s time you prepared for the final journey. Pay me now in advance, and I’ll bury you at half my normal price!” – Joshuah Sleeth. 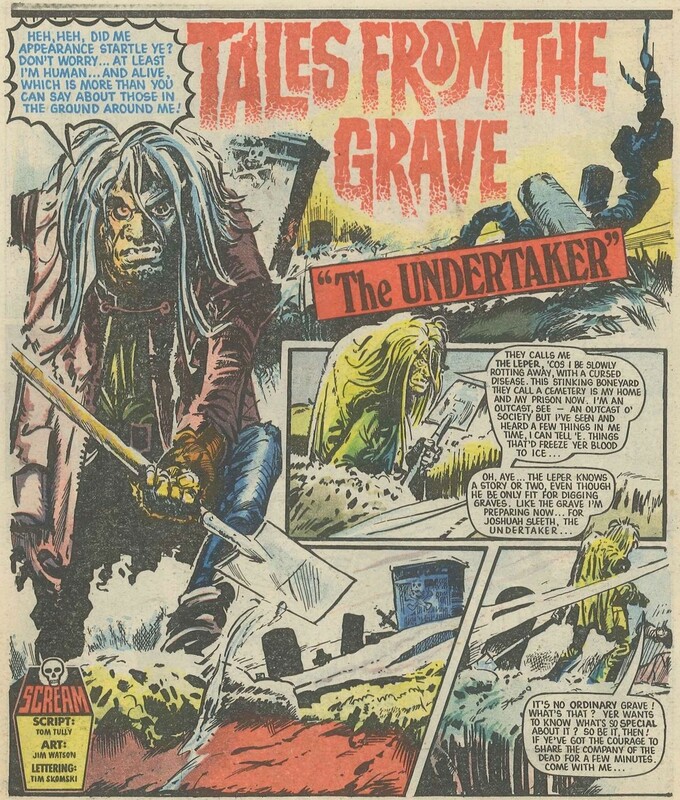 For me, by far the outstanding story of every issue was Tales From The Grave, 2 or 3-part chillers set in the early 19th century, narrated by The Leper who described the various spine-chilling background stories laced with all the period detail you could eat. The Cabbie And The Hanging Judge is also rather effecting, but, on this relatively mild autumn eventide, the very thought of Willard Giovanna RIP makes me shiver. One day, whilst The Leper is digging with his old mate Finley, a gentlemen dressed in “old-fashioned clobber,” enquires to the site of one Willard Giovanna. Finley pipes up and directs him over to a rather untended grave. Sure enough, when Finley resumes this unspeakable exercise, he finds the coffin, and opens it to find it empty, except for a letter – “an’ Saints preserve us!” – addressed to him! Here is your payment as agreed for digging up my coffin. A similar payment will arrive for you each month if you keep my grave in good order. Then there will be no need for me to return! And with that, the startled Finley turned around to get the shock of his life: Willard Giovanna had turned into a rotting corpse. This tale left me not so much fearful but fascinated: how do horror writers concoct such amazing stuff?! In addition, a different story appeared every week in a series entitled: Library of Death. Beware The Werewolf! was a great crime-caper drawn by yet another great artist we lost far-too-soon: Steve Dillon; Spiders Can’t Scream presented the terrifying consequences reserved for evil treasure-seekers who wipe out ancient civilizations in the South American jungle; the 2-part Sea Beast offered a freaky variant on the Don’t-go-into-the-water theme; while particular moody fav Ghost Town features ill-fated present-day car-drivers pitting their wits – and rifles – against Wild West ghouls who are always far too quick on the draw! “They thought they were too old to enter the house. They were wrong. No-one is too old… and no-one is too young! Age does not concern those who dwell in the Ghost House” – The Nameless One. Popular belief maintained that irate parents demanded the publication’s closure after giving their children countless nightmares. The truth, it seems, is rather more mundane. A printers strike at IPC Magazines affected half a dozen titles. Unfortunately, the one title NOT resumed post-crisis happened to be the one yours truly most craved every week! Over the last three decades, however, Scream comic has attained a richly-deserved cult status, with reprints now becoming widely available. “English horror didn’t vanish with the fog and gas-lit cobblestones at the end of the Victorian era. 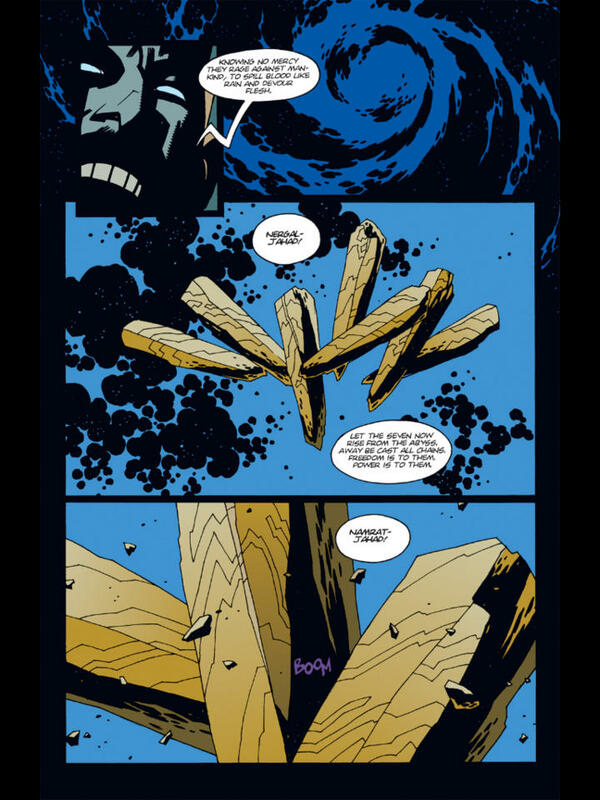 Riveting, spine-chilling stuff” – Alan Moore. 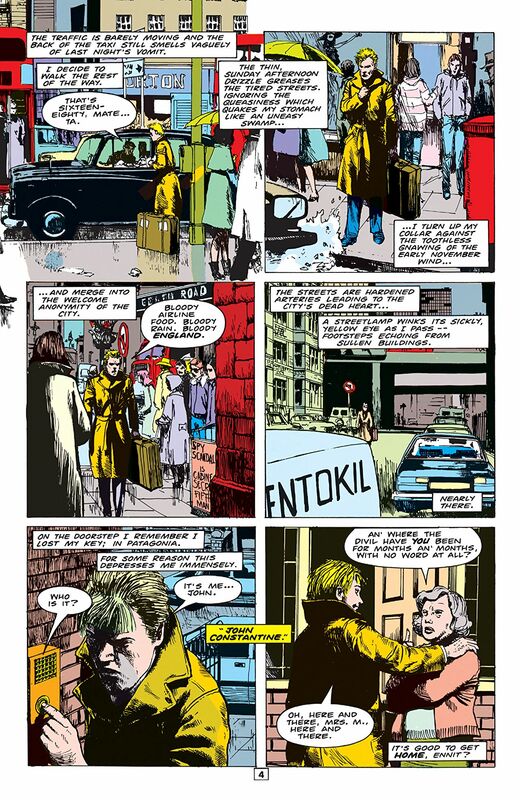 Hellblazer used to be one helluva haunting read. This series – part of Vertigo: DC’s “Suggested For Mature Readers” range – kickstarted my DC – and, to a certain extent, Marvel – revival in 1988. Offering eloquent, yet disturbing, forays into the crass, yuppie-driven, Thatcherite terrors of ’80s London – as if the dirt, grime and lousy English weather was not enough! – the scintillating, and yet exceedingly creepy, writing by Jamie Delano helped me “escape” from the rigours of that school year (luckily, mercifully, my last). 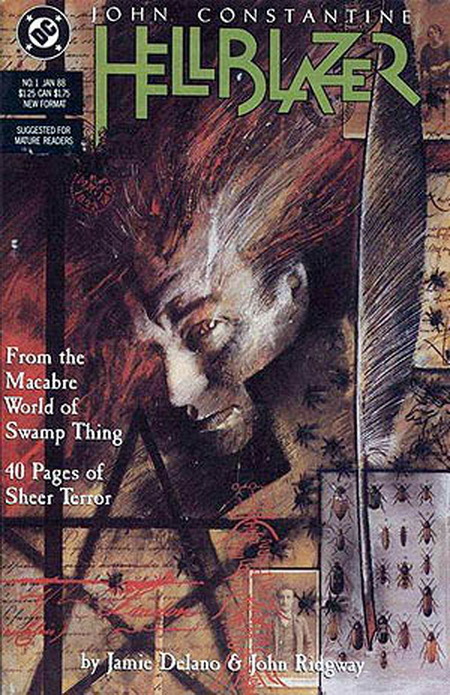 Each issue appeared unmistakably graced with glorious cover art by Dave McKean; the 1st issue’s collage (see above!) holds a reserved place in my Top 10 Best Comic Book Covers Ever. 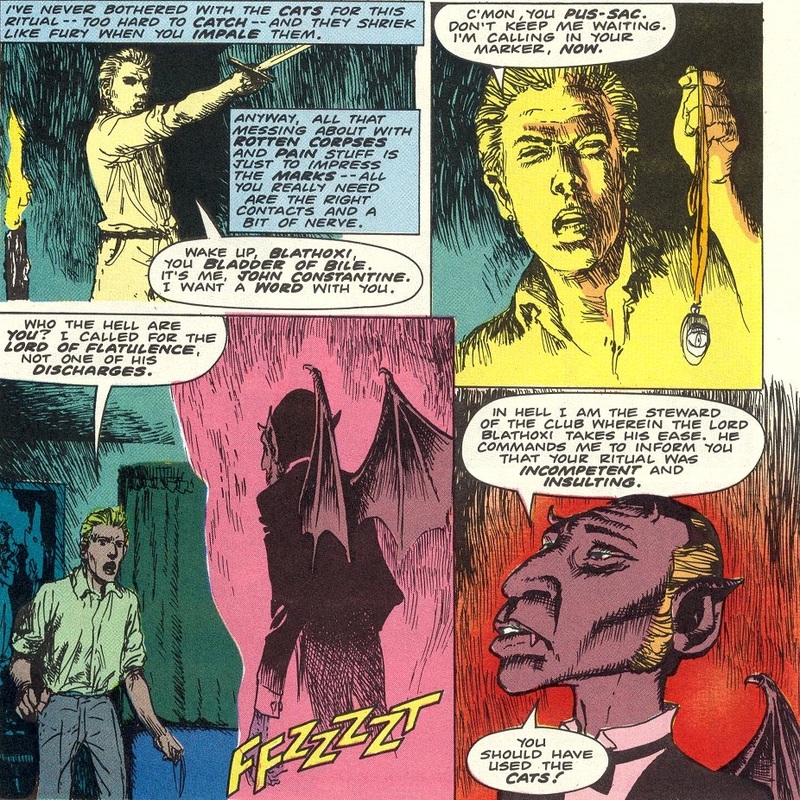 Co-created by Alan Moore, Stephen R. Bisette, and John Totleben, and based on Police frontman: Sting, John Constantine is a heavy-smoking, obnoxious fella (from Liverpool) who just happens to know a fair bit of the occult and is continually haunted by the ghosts of friends he failed to protect. Making his debut in Moore’s Swamp Thing, his own solo mag’s opening shocker: “Hunger,” dripping with voodoo – actually one of my least fav horror themes – remains a gobsmacking gamechanger. The first seven ishs offer a superb introduction to the work of British co-auteurs: Jamie Delano and John Ridgway, and would now be hailed as literary classics if they featured in anything other than the comics medium. “Pure reaction slams the door on the scuttling horror. I ought to just walk away and not come back. Jesus… Lord of the Bloody Flies, eh? I feel like I’ve had my share of bad craziness for a while. But like they say, you shouldn’t join if you can’t take a joke” – John Constantine. “Berni Wrightson really is the unquestioned master of the medium and that’s not just because the cover blurbs say so and because the field is about 95% saturated with superheroes… Oh, Berni knows his grave-dirt all right… and while we huddle there, backs turned, eyes averted, minds set, Berni pops up in front of us with his magic mirror and says “Boo!”” – Bruce Jones. 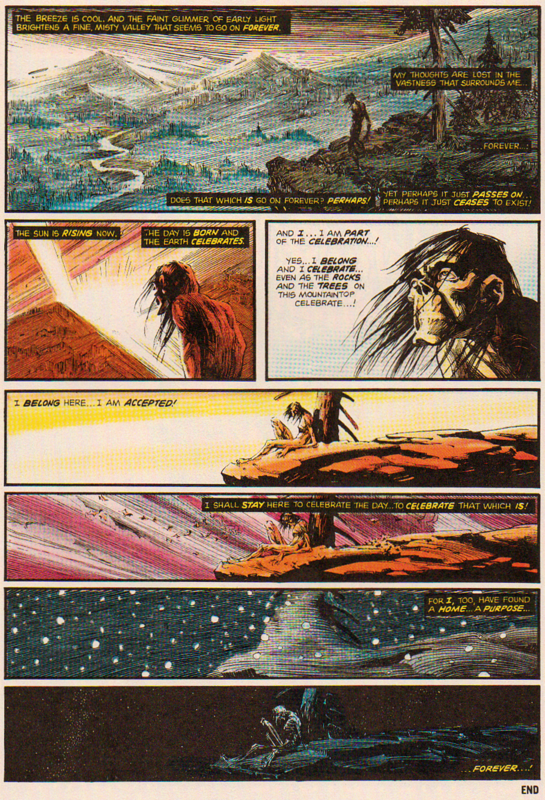 It is impossible to compile such a Post as this without featuring the extraordinary talent of the late, great Bernie Wrightson – arguably THE quintessential horror comic artist. In fact, Pacific Comics gratefully collected some of his classic works in Berni Wrightson: Master Of The Macabre (only 5 ishs published during 1983). Who could ignore the malformed terror that is Jenifer, the sinister deception played on The Laughing Man or the heartrending beauty of Clarice? But my thirst for awesomeness would be well and truly slaked with The Muck Monster, Berni’s moving version of Frankenstein, as told from the monster’s perspective. Oh, which of these seven sublime pages should Brad select?! Ha, he cheated! And presents TWO. October 31, 2017 October 31, 2017 mlbradford books, cake, Dystopian World, Frickin' Quarnex Battery, H. P. Lovecraft, History, Horror Movies, Lucid Dreams, Music, Nostalgia, Psychology, Quest, Religious Issues, science fiction, Stuff that Matters, Videos, What Is Real? “The door was opening again. The seer does not like to dwell upon what he saw entering the room… The sound of cries – faint, as if coming out of a vast distance – but, even so, infinitely appalling, reached the ear…” – M.R. James. You join me at Pluckley, in Southern England, reputed to be the most haunted village in the country. At the last count there were thir13en ghosts, but recently, locals have reported a few new apparitions. We shall begin the tour at the top end of town. Continue down the road until we reach Dicky Buss’s Lane. Shortly after the First World War, a schoolmaster – who, perhaps, could no longer take the torment of lingering shellshock – hanged himself from a laurel tree that once stood in the road. Pale and tender, warm and rare. Locked in memory, slumber’s snare. ‘Less ’tis guilt I’m blindly led” – Bruce Jones. A short distance to the east, we arrive at the Church of St Nicholas. 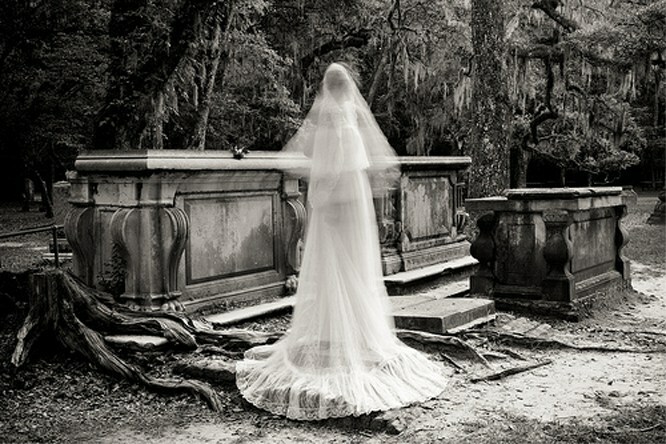 Ghosts normally haunt the place of death. 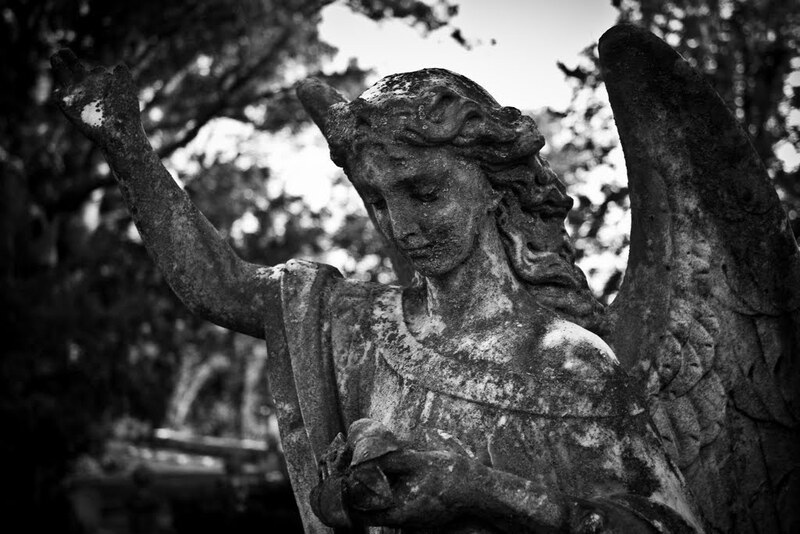 A graveyard seems the natural place to expect supernatural activity, but this is not the case. Generally. This parish, however, offers the exception. There she is! We can catch a glimpse of the Red Lady; the beautiful Lady Dering carries a red rose as she drifts majestically amongst the tombstones, wearing the same sumptuous gown as on that day so grim. Her body was placed in seven lead coffins, one inside the other, then put into an oak casket and laid in a vault under the church. For nine centuries ‘pon this ground she has shone. Certainly she will remain, long after the church has gone! Some distance down the southern road, at a house called Greystones, the grounds are frequented by a phantom monk; and yet further down this very road, stands a house known as Rose Court. It is four o’ the clock in the afternoon; the Lady of Rose Court appears, sitting by the bay window – she looks so forlorn. She died many years ago – at 4pm – by drinking the juices of crushed poisonous berries, looking out of that window, towards Greystones; not surprising, then, to discover that she can often be seen with the monk. It is so quiet here in this thrice-cursed hamlet, on this day of all days. Only the ghastly sound of my heavy boots trudging down this country lane breaks the unnatural silence. Nobody comes out to meet and greet me. You’ll see, you’ll see her when she starts to call” – Carl McCoy. Near a house called the The Pinnock lie the ruins of an old mill. The black form of a miller’s ghost has been seen, but only during thunderstorms. The clock lopes to half past five. Yet it seems we’ll be spared any autumnal downpour, let alone any peal o’ thunder. Us a visit this day. Further down the southern lane on the way to Maltman’s Hill, the hoofquake of four phantom horses and the clatter of the coach it draws can only be heard on the darkest of nights. A short stroll westwards to the outskirts of the village, and we arrive at a crossroads, named – appropriately enough – Fright Corner. Oh, YOU KNOW his name. All too well. What can we say about him? Bold and badass, dashing and devil-may-care – sound familiar…? Things that go bumptious in the night…? Always on time – ne’er fail – these wretched coves! The gang of dark shapes emerge from the field yonder – each misbegotten soul brandishing his own blade, devilish hearts brimming with the fury of murderous intent. That the worst shall come to pass by such a frightful deed. And Terror crept behind” – Oscar Wilde. “Lovecraft creates dark and sometimes horrific scenarios which, in their tense and gothic style, can seem like the visions of a madman. The formless entity dominates his work, an impalpable threat which lies beneath everything he wrote…” – The SF Source Book. With Halloween just about a fortnight away, the focus shifts inevitably from SF to horror. One fine way to execute a clean transition between the two is to select one of the main masters of the macabre: Howard Phillips Lovecraft (1890-1937) who – through his twisted scribblings – managed to encompass both genres. Surely, you may think, his distorted visions were too dark and twisted to nestle satisfactorily within the boundaries of SF? Nevertheless, there are good reasons for Lovecraft’s work to be included unquestionably into the realm of science fiction. Primarily, a considerable proportion of those “unspeakable entities” that languished amidst “his cluttered prose” were not so much demons but aliens. Moreover, he was one of the first authors to write and describe alien beings. Outside of the Cthulhu Mythos, he certainly wrote more genuine science fiction. The most striking examples include: In the Walls Of Eryx, set on Venus, reimagined as a jungle planet; and tales of unorthodox scientific experiments: From Beyond (made into a movie in 1986) and Cool Air (which deserves big screen treatment). A significant proportion of his short stories were published in Weird Tales, a predominantly SF magazine of the 1920s and 30s; The Shadow Out Of Time was first published in the June 1936 issue of Astounding Stories, then the most prestigious science fiction magazine available. Despite undesirable accusations of muddled prose and complicated storytelling, Lovecraft remains one of my favourite 20th century authors. Ironically, his complicated style is distinctive and had such a profound effect on me, helping to conjure some of my own fictional nightmares. “[Universal] were blown away by the visual presentation, they openly admitted to loving the screenplay, saying it was dead on… I do not want ‘Mountains’ to be bloody, I do not want it to be crass, but I do want it to be as intense as possible” – Guillermo del Toro. 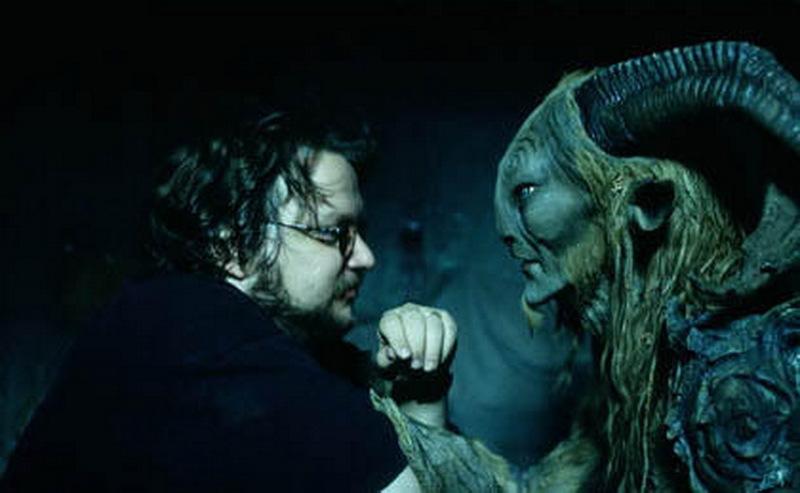 Guillermo del Toro is one of the most talented film-makers working today. 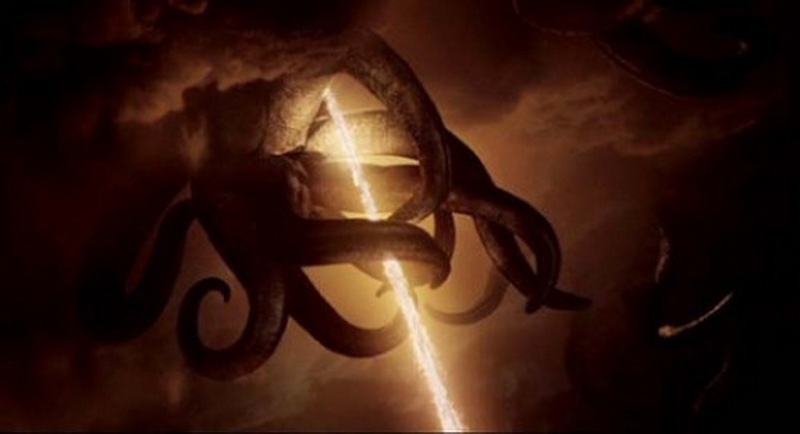 It is no secret that, just a few years ago, the Spanish director should have made his own grandiose cinematic version of Lovecraft’s At The Mountains Of Madness. 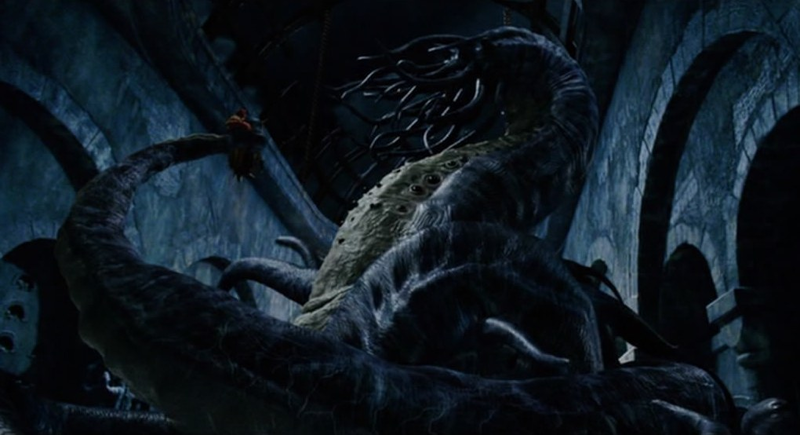 However, del Toro would not be perturbed for long; he resurrected his dormant plans for his Lovecraft project in 2013. 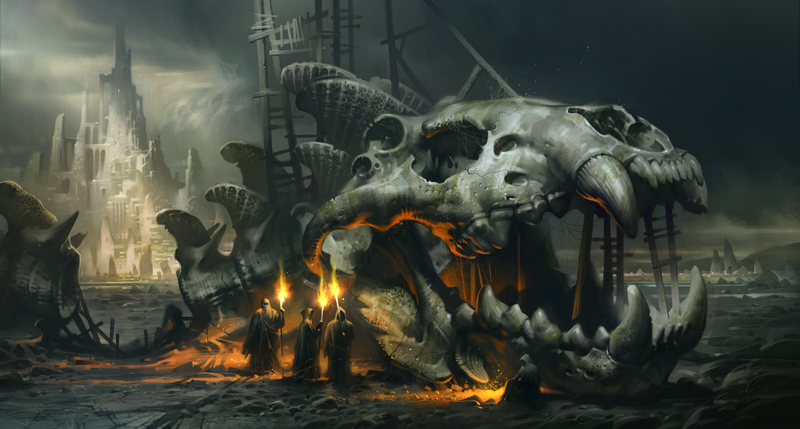 “In the coldest regions of space, the monstrous entities Ogdru Jahad – the Seven Gods of Chaos – slumber in their crystal prison, waiting to reclaim Earth… and burn the heavens” – De Vermis Mysteriis, Page 87. 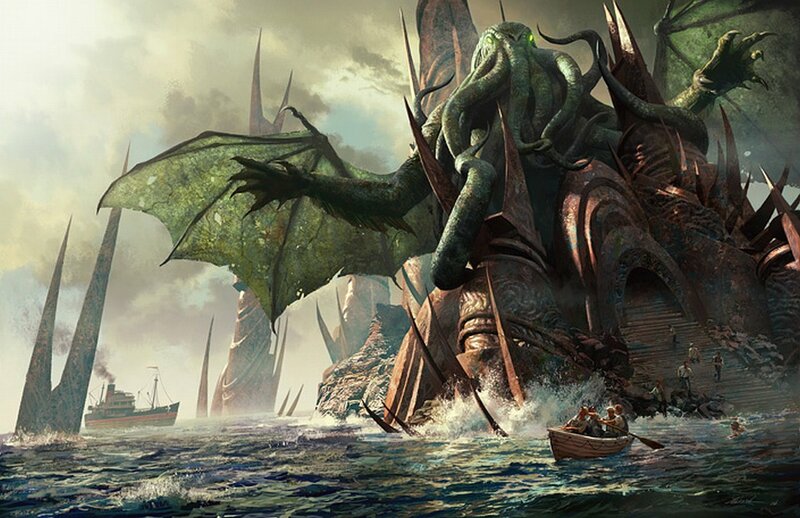 A quick glance at modern strands of science fiction and horror – be it literature, movies or comics – it doesn’t take long to find the influence of the Cthulhu Mythos. The most notable is the Hellboy comic, created by Mike Mignola in 1993. Developed into one of the stranger – and better – of the recent crop of comic book movies, directed by (what a surprise) Guillermo del Toro in 2004, the titular hell-spawned hero (played by the ever-reliable Ron Perlman) has to battle with not only Rasputin the “Mad Monk,” but the Ogdru Jahad, the most blatant nod to Lovecraft you’ll get in a mainstream comic book movie. 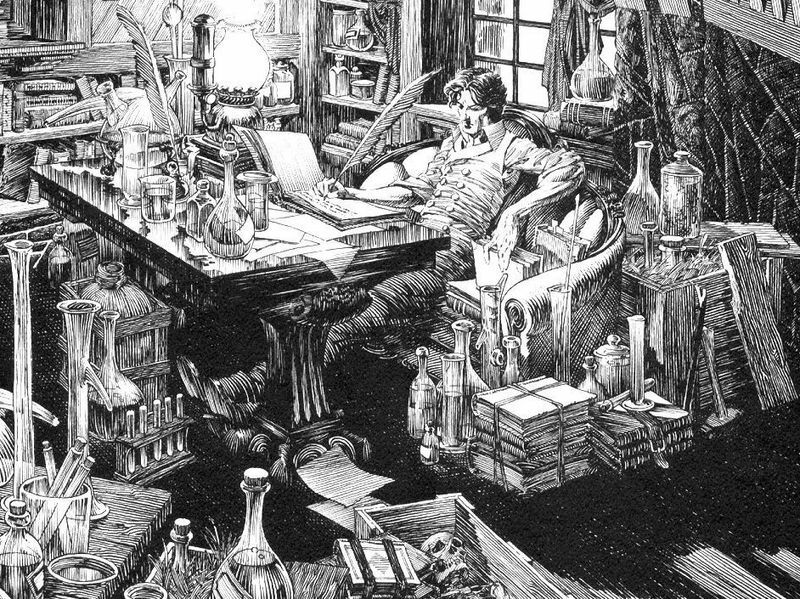 Lovecraft’s work may not seem best suited to the medium of comics, but in the ever-capable talented hands of the artistic genius: Berni(e) Wrightson, it works wonders. 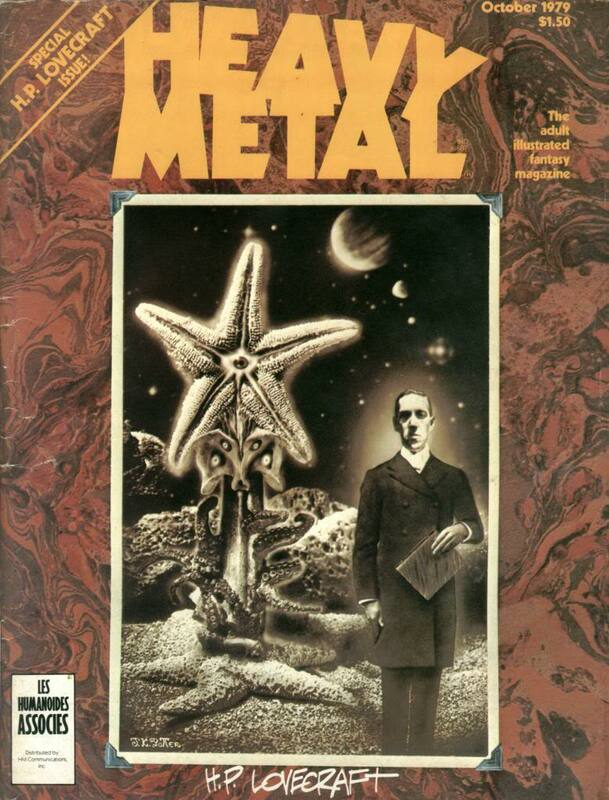 A number of Lovecraft’s stories were adapted brilliantly by Wrightson and published in Creepy Magazine during the ’70s. 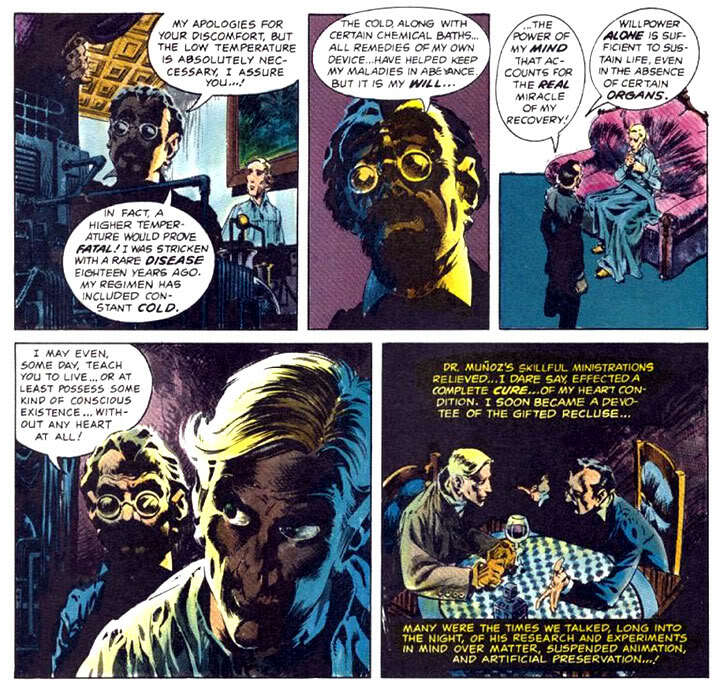 In 1971, he did a splendid job on the aforementioned Cool Air, which came into my collection a decade later when Eclipse Comics compiled Wrightson’s best horror strips (in added colour!) 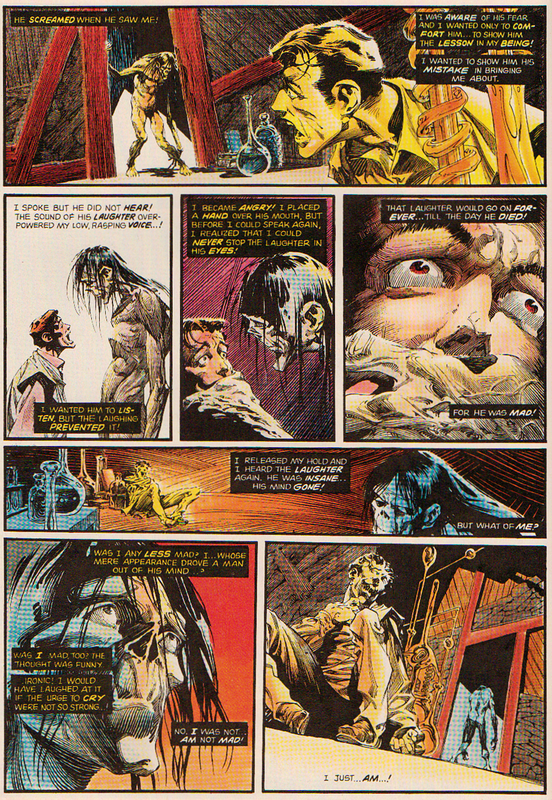 in Berni Wrightson: Master Of The Macabre. The seventh and final page is a creepy classic single splash and will be saved for a forthcoming Post! Have just discovered this (below) online; how long will it take to track this particular issue down? 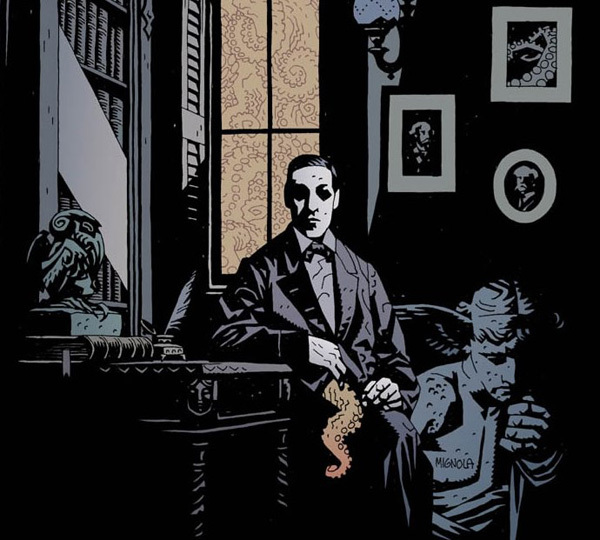 A portrait of H. P. Lovecraft by Mike Mignola, the creator of Hellboy. And, come on, if we’re going to end this Post with Hellboy gifs, might as well have the one with that dastardly mute puppet, the “freak in the gas mask”: Karl Ruprecht Kroenen (“Hitler’s top assassin and Head of the Nazi Cthulhu Society”) performing his ubercool blade-twirling trick inside Manhattan’s Metropolitan Art Museum. “What horrible will could keep such a creature as this alive?” – Professor Trevor Broom.